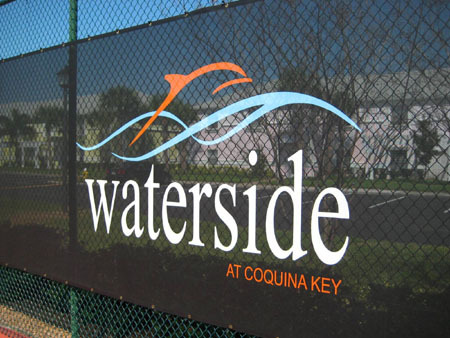 Tennis windscreens – whether for function or for fashion – are a great asset to any court or facility. 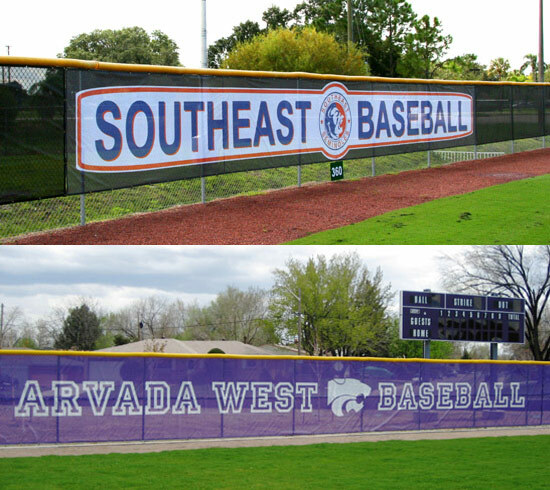 They provide privacy, allow you to see the ball better while in play, and just look darn good on your fences! However, as many of you probably know, once you have decided that you cannot live without windscreens, you must then decide on whether to have custom screens tailored to your facility, or to roll up your sleeves with a Do-It-Yourself option. If you want logos, then you must have custom screens measured for your facility or court(s). There is no such logo option available on the rolls of DIY windscreen. Your screens will look fantastic with the logos or names of your club/community, but please be prepared to wait a little longer to have your order delivered to your doorstep. Additionally, some of the custom windscreens might be available in colors other than the standard green and black, giving you more control over the finished look of your court. We recommend the Tuffy windscreen with its Chroma-Bond Imprinting option for your logo’d screens! As the Official Tennis Windscreen of the USPTA, it is our most popular option by far for custom screening, has the longest warranty, and is an all-around quality option. This brand of screen is also available in 20 different colors, allowing you to match school/team colors, or make your courts stand out with a brighter hue! If you are under a time crunch with no time to wait for custom screens (even without logos, it can take a couple weeks), then perhaps you should look at the DIY options available to you right away! For tennis courts, 1o-S Tennis Supply offers a roll of 120′ long screening, called 10-Shade Plus, that features grommets along the top and bottom, with the option to cut along the sides to create pieces which will fit the fence sections of your court or facility. It is offered in rolls either 6′ or 9′ high, with color options of green or black. In case you are unsure on the process of properly cutting and installing this windscreen option, we have an instructional video to help you out! If you are not excited at the prospect of cutting your own windscreen pieces, you might be better served with custom-cut screens. This way, each portion of the fence has been carefully measured and each piece of windscreen cut to those specific dimensions before it gets to your door, with no guesswork in sight. These pieces of screen will be grommeted on all four sides, and most screens even have the option of including standard half-moon flap vents, or bound/hemmed windows. These vents can be very helpful in high wind areas, or for those facilities that like to have some visibility through the screen. For help on properly measuring for [any type of] windscreen, and installing the custom screens, our videos can be found below! Custom-cut windscreens (especially with logos) look great on any court, but will usually cost more than a roll of DIY windscreen. If you are in need of a more economical option for the windscreens at your facility, you might need to choose the roll which you will cut yourself. If you are more concerned with having the best-looking screens possible, or have just a few small pieces to replace, you might consider the custom cut screens. If you are unsure which option might suit you best cost-wise, the friendly staff at 10-S Tennis Supply would be happy to provide you a free estimate! If you are local to the South Florida area, and are interested in getting your court(s) professionally measured for windscreen, or to have those screens installed, 10-S Tennis Supply may be able to help! For a better look at these instructional videos (as well as other product and instructional videos), or for more information, please visit our website at 10-s.com, or call 800-247-3907.